Un Il-28R du 11.ORAP à Welzow en 1956. On notera l'absence de canon du côté droit sous le nez vitré. © Archives famille V.Bachaev. 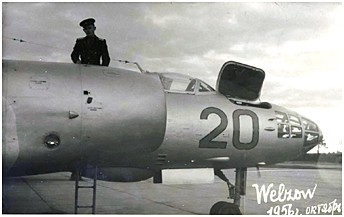 An Il-28R of the 11.ORAP at Welzow in 1956. One can see that the right gun was not mounted under the glazed nose. © V.Bashaev family archives. The association of the 11th Vitebsk Red Banner and Kutuzov IIIrd Degree Orders (1) Separate Reconnaissance Aviation Regiment with Germany and Welzow Airbase extends over the continuous period from July 1954 when the unit settled there until June 1993 when it was retired under the general withdrawal of Soviet-Russian forces from the former GDR. The 11.ORAP was activated in July 1942 in the Kalinin District. It was equipped at that time with the Petlyakov Pe-2(R), an aircraft type that would remain on strength with the unit for ten years, until 1952 when it was replaced by the Il'yushin Il-28R. The regiment with its reconnaissance "Beagles" was relocated in 1954 from Krustpils (Ekabpils) in Latvia to Welzow (2). The reconnaissance version of the twin-jet Il-28 flew for the first time on April 19, 1950. Few external differences distinguished it from the bomber version. The cannon on the right side of the nose was missing (and the supply of ammunition for the remaining gun was reduced). However, the main feature that set the IL-28R apart was the addition of two 950-liter fuel tanks at the wingtips (3). Moreover, a 750-liter tank also could be placed in the rear of the bomb bay in order to make room for cameras. Standard fuel tank n°3 located in the front upper part of the bomb bay was not present on the reconnaissance version of the "Beagle." Nevertheless, the addition of the aforementioned tanks finally permitted a range increase from 2580 to 3040 km at 10,000 meters at cruising speed. Three of the four onboard cameras were housed inside the bomb bay. The first two were AFA-33/75 or /100 models (sometimes AFA-42/75 or /100). The third position was occupied both by the optional 750-liter fuel tank and a smaller AFA-33/20 or an AFA-42/20 camera. Finally, the reconnaissance suite also included an AFA-33/50 or /75 camera (note that AFA-BA-40 or AFA-RB cameras also sometimes are referred to) pointing obliquely to the left in the tail section (the camera hatch was at the bottom of the left side of the rear fuselage at the same level as the root of the vertical stabilizer). The rear compartment and the bomb bay were heated. It was necessary to open the doors of the latter in order to use the main cameras. Note also that, in addition to bombs, Il-28 bombers were always likely to carry an AFA-33 camera in front of the bomb bay provided that bomb size or arrangement inside the bomb bay allowed a camera to be installed. During night reconnaissance missions, the IL-28R carried either two 500mm NAFA-3s cameras or a single NAFA-MK-75 camera. As you will see on the above document, there is some doubt about the possible night reconnaissance equipment in the aft compartment. Also, 50kg FOTAB-50 (twelve of them, or only six when the 750-liter fuel tank was carried), FOTAB-100 or SAB-100 flare bombs were carried in the rear part of the bomb bay. Furthermore, it is almost certain that other specialized versions of the Il-28 flew alongside the Il-28R (and Il-28U "Mascot" training aircraft) of the 11.ORAP. 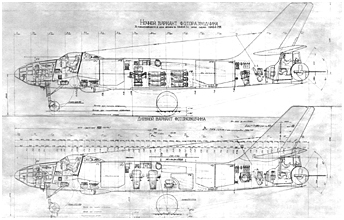 These aircraft, also delivered to some "fraternal countries," could have been Il-28RTR ELINT variants without wingtip tanks but equipped with a second ventral radome under the sealed bomb bay - such aircraft versions were actually observed in the GDR - or Il-28REB electronic warfare variants equipped with wingtip tanks converted into electronic pods with a dielectric radome to the front and to the rear (4). 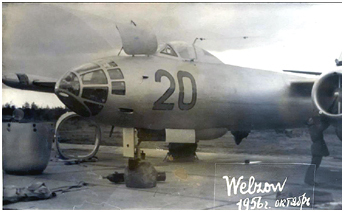 Note that the photos illustrating this text could possibly concern a special version of the IL-28R (read the photo captions). On peut aperçevoir sur cette photo apparemment anodine prise à Welzow entre 1959 et 1961 le bout d'un conteneur caractéristique d'un Il-28REB de guerre électronique. © A.P.Telniy/bvvaul-barnaul.narod.ru. This seemingly innocuous picture taken at Welzow between 1959 and 1961 reveals the wingtip ECM pod of an Il-28REB. © A.P.Telniy/bvvaul-barnaul.narod.ru. The association of the 11.ORAP with the commissioning of East German Il-28s deserves a mention, although historical accuracy is undermined by the lack of non-contradictory accurate information. The LSK /LV took seven Il-28, two Il-28R and one Il-28U into the inventory. They essentially were used to tow or drop targets. The first two "Beagle" delivered in June 1959 to the 3.Staffel of JG-1 (Jagdfliegergeschwader) in Cottbus came from the ranks of the 11.ORAP. Logically these aircraft should therefore have been Il-28R (the only Il-28U was delivered in 1961). However, according to the information available, the two aircraft delivered in 1959 were not reconnaissance variants. On the other hand, personnel of the future target-towing squadron (Zieldarstellungstaffel) underwent conversion training - theoretical and /or practical? - with the 11.ORAP. The confusion increases when we consider that two Il-28R served as flying test beds for the "Pirna" reactor destined for the East German "152" (Baade 152) airliner project. The first aircraft arrived in the spring of 1958, the second one in 1959. Two hundred eleven test flights were carried out between September 1959 and June 1961. These aircraft subsequently were transformed into target tugs and transferred to the LSK /LV where they flew using the coded designators "180" and "184." In 1966, two years before the Il-28 withdrawal, the third squadron of the 11.ORAP received Yak-27R "Mangrove" reconnaissance aircraft. The superior performance of the new aircraft made it possible to use the cameras in a supersonic flight regime. It was possible to take pictures at altitudes up to 16,000 meters at subsonic speed and between 12,000 and 14,500 meters at supersonic speed. However, the Yak-27R had an important drawback. Missions could only take place during daylight when the visbility was sufficient. 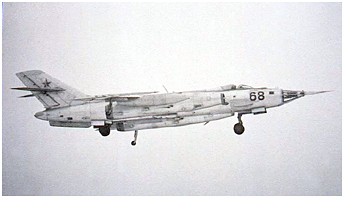 The Yak-27R had four photo compartments distributed over the entire length of the fuselage. 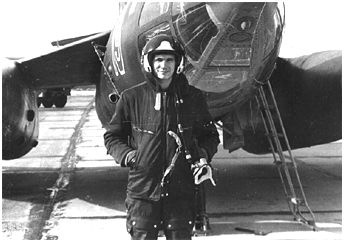 Above 1000 meters, the navigator used a PV-2R optical viewfinder protected under a small dome located under the nose to decide when he could trigger the cameras. The first camera was mounted obliquely right in front of the gun nozzle orifice of the single 23mm NR-23 cannon mounted on the right side of the fuselage. A sliding door protected the compartment of this camera, as well as those of the others. It was not possible to operate the gun when that photo hatch was open. Another compartment containing a topographic camera was located under the belly behind the wing trailing edges. Further back, there were two more camera bays with vertical cameras. Camera types included AFA-42 models with different focal lengths (varying according to the aircraft odd or even construction numbers). A smaller AFA-41/10 vertical camera was used for small-scale photographs of land strips from the altitude of 300-400 meters, or to get an overview of the targets from a higher altitude. Le pilote V.N. Akayev devant le Yak-28R n°19 à Welzow. Une vitre optiquement plate était montée sous le nez vitré des Yak-28 de reconnaissance. © V.N.Akayev/bvvaul-barnaul.narod.ru. of 10 kilometers (250 km from 4000 meters) within a 50º radius. 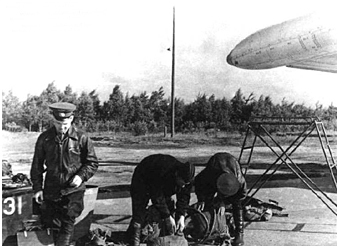 Some "Brewer-D" were equipped with a TARK (Televizionnyy Aviatsionnyy Razvedyvatel'nyy Kompleks) airborne television reconnaissance complex comprising TV cameras and a data link for real-time transmission of images to a ground station. The transmitting antenna was located under the Initsiativa radar fairing that was not mounted on this Yak variant. A camera with a focal length of 190mm also was carried. This version would have been designated Yak-28RL. 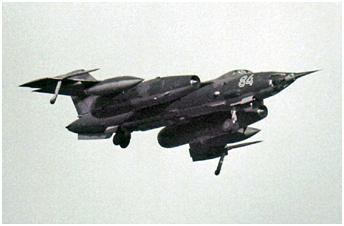 It is not excluded that other versions derived from the Yak-28R also flew with the 11.ORAP like the Yak-28SR that carried a SPS-141 or -143 ECM passive jamming system, or the Yak-28RR that instead of external fuel tanks carried special pods used for measuring the levels of radioactivity in the air. These pods, designated RR8311-100 or Fuka, resembled rocket pods. 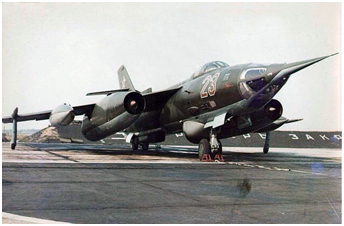 This type of pod was originally developed for the Yak-28R; however it eventually was adapted to many aircraft types as varied as the An-12, Tu-16 or Su-27. 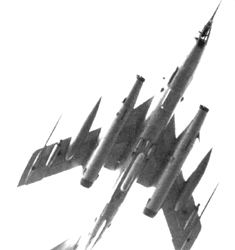 Once equipped with these pods, the Yak-28L "Brewer-B" tactical bomber would have taken the Yak-28RL designation. This variant was positively identified within the 931.OGRAP at Werneuchen (see this > Picture). Of course, the 11.ORAP had some two-seater Yak-28U "Maestro" training and conversion aircraft within its ranks. After the first and second squadrons were reequipped with Yak-28R from 1968 on and replacement of Yak-27R in the third squadron by Yak-28PP in 1970, the 11.ORAP therefore was equipped only with Yak-28s. While the regiment certainly has employed some electronic warfare aircraft during the Il-28 period, establishment of a full Yak-28PP (PP for Postanovshchik Pomekh - Jammer) squadron clearly announced that the regiment was a composite reconnaissance and electronic warfare unit. To mix reconnaissance and electronic warfare aircraft in the same regiment was not surprising. The easy maintenance of two nearly identical airframes was an obvious reason. On the other hand, reconnaissance aircraft had to identify the threats on the penetration axes along which the attack aircraft protected by Yak-28PP would fly. 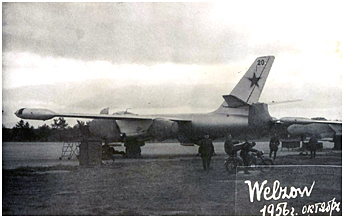 The "Brewer-E" was series produced in Irkutsk from 1970 on and consequently the 11.ORAP quickly took into its inventory a new aircraft dedicated to the protection of bomber formations over the battlefield. 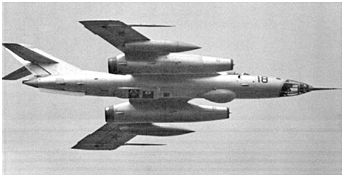 In order to jam enemy radars, the Yak-28PP carried an electronic countermeasures suite that included the Buket (Bouquet) and the SPS-5/M Fasol'-1 (Kidney Bean). These jammers were available in different versions in order to cover different frequency bands. Thus, several aircraft equipped with different jammer versions could fly together to counter any threat when that was deemed necessary. The Buket variants carried by the Yak-28PP were SPS-22, SPS-44 and SPS-55 models. There were four different versions of the Fasol'-1. A retractable module that had to be lowered to the ground and removed for any maintenance or inspection replaced the former bomb bay. It was not possible to access the equipment bay without lowering the module so changing the jammer variants for specific missions was time consuming. Fortunately, interchangeable modules became available beginning with the fourth production batch. The ECM suite housed inside the module included the Fasol'-1 and Buket jammers - the antennas of the latter were housed under a long prominent fairing located under the equipment bay. The special trolley used to move the module had a protective screen that fit around the shape of that fairing. It had been designed to operate the Buket on the ground while protecting personal from the powerful microwaves generated by the system that were then transformed into heat. There also was an antenna for the SPS-5 jammer under each engine nacelle. The vacuum tube electronics generated considerable heat and they had to be cooled, hence presence of three ventral air intakes (two heat exchangers and one air scoop) under the center fuselage forward of the equipment bay. The Yak-28PP also had passive jamming systems. Thus, two UB-16-57UM rocket pods attached to BD3-60-21UM pylons could be mounted outboard of the external fuel tanks. They held sixteen S-5P rockets filled with fiberglass dipoles coated with metal. Once fired, these rockets exploded in front of the plane, deploying a cloud of decoys that created a radar echo. An Avtomat-2I ASO-2I flare launcher system ensured that the aircraft were protected against radar and IR-guided missiles. Flares could be fired manually or automatically via an SPO-3 Sirena-3 (Siren) radar homing and warning receiver. The KDS-19 cassettes containing the flares were mounted under the engine nacelles. Also, a Siren' (Lilac) complex ensured aircraft protection by returning false radar echoes to disrupt firing radars. Here also, the Siren' complex comprised several versions: SPS-141, -142 and -143. Its electronics occupied the former gun bay of the GSh-23Ya cannon on the right side of the nose. Yak-28R and Yak-28PP were the "Brewer" variants that remained in service for the longest time, including in the GDR. Besides the importance of this type of aircraft in the Soviet military arsenal, it seems that their reliability was important for this situation, which goes against the usual gossip from the west. The Yak-28PP were transferred to Werneuchen in June 1986, where for a few months they formed the second squadron of the 931.OGRAP. Also in June 1986, the last 931.OGRAP Yak-28R moved to Welzow, where they took the place vacated by the departure of the "Brewer-E." The 11.ORAP had thus lost its electronic warfare squadron. 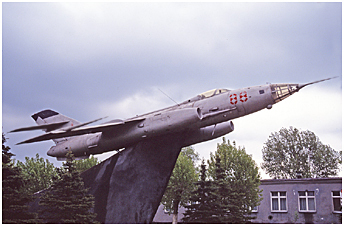 This was only a temporary loss, as replacements for the Yak-28PP, namely Su-24MP "Fencer-F," landed at Welzow in 1989. All Yak-28R still present in the GDR had thus been concentrated within the 11.ORAP for their imminent departure from Germany. In the meantime, their successors, new Su-24MR "Fencer-E," had arrived at Welzow from where they flew their first operational sorties in February 1986. The last fourteen Yak-28R of the 11.ORAP definitely left the GDR on July 2 of that year. Des vétérans du 11.ORAP en visite à Welzow, devant un Yak-28R. © V.N.Akayev/bvvaul-barnaul.narod.ru. 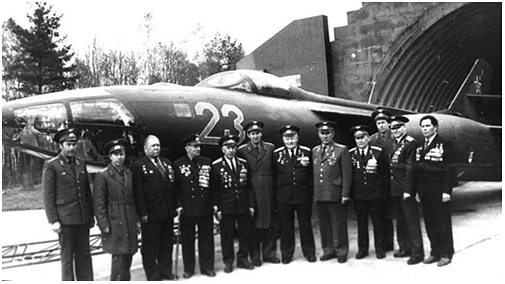 Veterans of the 11.ORAP visiting Welzow, in front of a Yak-28R. © V.N.Akayev/bvvaul-barnaul.narod.ru. (1) Mikhaïl Ilarionovich Golenishchev-Kutuzov (St. Petersburg 1745 - Bunzlau, Silesia, 1813). Son of a general of Tsar Peter the Great and Marshal of the Imperial armies, Kutuzov was appointed prince and then supreme commander of the Tsarist army in 1812, before becoming the commander of the armies of the Russo-Prussian coalition in 1813. He is generally recognized as the principal architect of the defeat of Napoleon's armies in the Russian campaign (June-December 1812). (2) Sometimes also known as Neu-Welzow or Spremberg. (3) Il-28T torpedo planes of the Navy also were equipped with wingtip tanks. On the other hand, some IL-28R were converted into target tugs (see > The target-towing units). (4) The exact names of these variants remain questionable. 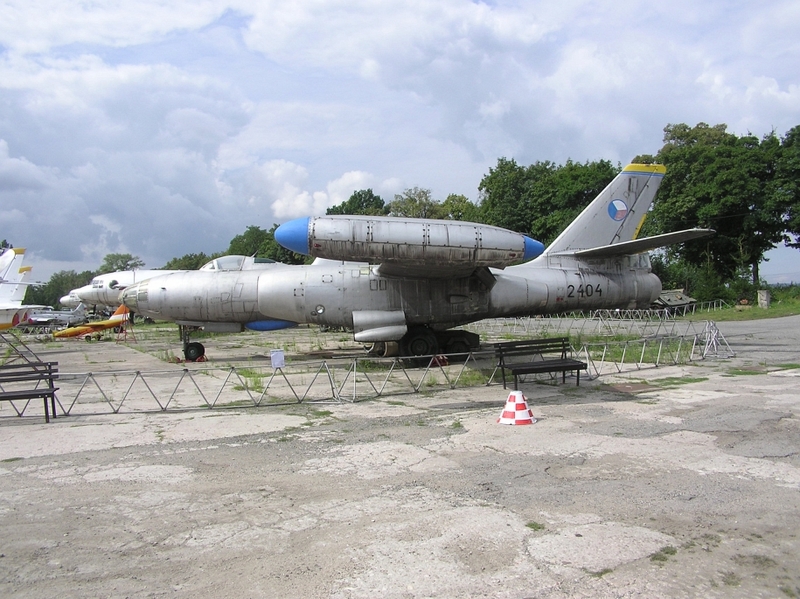 The Il-28RTR preserved at Witkowo in Poland is designated Il-28E. This is probably a local designation. The Il-28REB preserved at Vyskov in Czech Republic is designated Il-28RT. Is it an error? (5) This type of camera was initially developed in the USSR in 1936. It was used to photograph the ground passing under the plane continuously through a rectangular opening (general layout > here). The contact sheet obtained looked like a continuous mosaic picture. The camera body in principle comprised two different lenses that made it possible to obtain the same image in two different scales at the same time.